The Polish Student Society at Columbia University and Barnard College exists to promote greater understanding of Polish culture, public affairs, history, and society throughout the Columbia University and Barnard College academic communities. 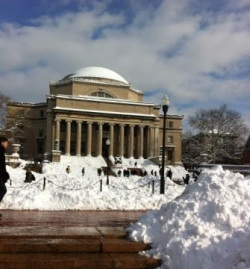 The Polish Student Society is a student organization duly recognized by both Columbia and Barnard. One need not be Polish to join, but may simply be interested in the country and its rich and ancient traditions. We bring internationally renowned speakers to campus, host the annual Chopin Piano Competition, hold exhibitions, memorials and traditional holiday celebrations in the Polish custom, present screenings of movies by great Polish film directors, hold a regular informal Polish conversation hour for those seeking to get in touch again with their legacy and language skills, and lead gourmet field trips to Greenpoint in Brooklyn. We also march in the annual Pulaski Day Parade with a Columbia banner and keep in touch with our counterparts at NYU to discuss joint projects and to support each other's mission. When all is said and done, we are a group remarkably supportive of each other that has a great time with revivals of a culture that stood at the cradle of the American revolution as much as the French did, and has contributed many heroes to its legacy. Not less than 75 million Americans nowadays claim Polish heritage and descent, and we enjoy reaching out to them in every way we can, as well as to institutions, scholars and organizations in Poland.